I am such a fan of burgers. I’m always trying different combinations of nuts, beans and veggies. 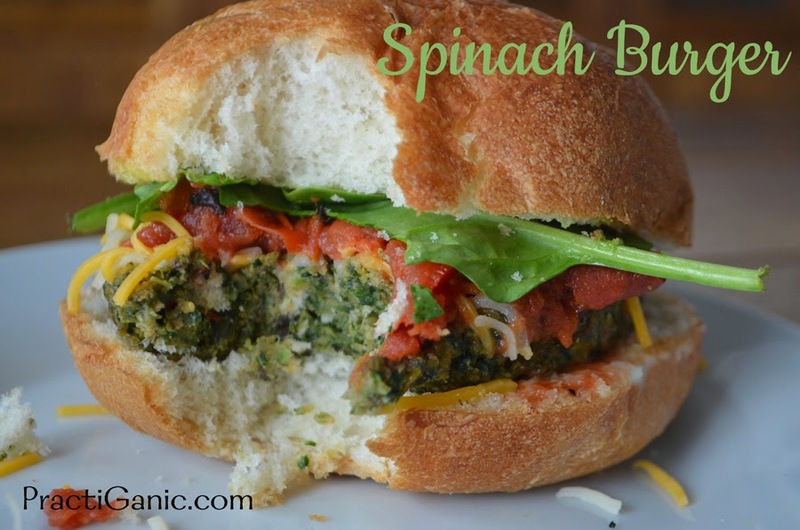 The spinach burger has been one of the go-to burgers for sometime now. I feel like it has everything … a healthy dose of spinach, nuts, beans and cheese! Plus the kids love it! When Savina went through her stage of refusing to have someone else feed her but didn’t even have teeth yet, burgers were my best friend. These are so quick and easy to make and they store really well. I will make large batches and freeze them in the summertime. When we go to a friends house for a cookout and I don’t want to eat a dried up store bought burger it’s always nice to be able to pull a few of these out of the freezer and throw them on the grill! I always cook them thoroughly before I store them. Mix all ingredients in a food processor. Bake at 400º for 13 minutes. Flip and bake 5 more minutes. Great idea!! I'm going to have to try that next time.